Often depicted as companions of the very rich, these tiny dogs have outsized ears that help them stand out in a crowd. Learn more about this energetic breed and their mysterious beginnings. 1. NO ONE IS SURE WHERE THEY COME FROM. Small spaniels resembling the papillon could be found in Europe starting in the 1200s, but it's unclear where the dog originally hailed from or what its ancestry is. Some believe that the breed originated in China, where a similar-looking dog eventually became the modern day Pekingnese. Others look to the Japanese chin as an influencer of the breed. Some doubt that there's any Asian influence at all, as Europeans managed to shrink down other breeds without the help of these smaller Eastern dogs. Regardless of where it came from, the dog has strong roots in Europe. The French and Belgians refined the breed, giving it a high-domed head and feathered ear fur. 2. THEY WERE USED AS RATTERS. Papillons were bred as ratters in order to rid homes of pests. The adorable dogs were too small to directly kill a rat like other breeds, so they had to use special methods. Their main strategy was to bait the rat and tease it until it became too exhausted to fight back. Once the rat was too run down to put up a fight, the dog could make its final move. 3. THEIR NAME MEANS "BUTTERFLY." Papillon is French for "butterfly." The canines earned their bug-inspired name thanks to their ears, which fan out like butterfly wings. The dogs previously went by other monikers, including the dwarf spaniel and the squirrel spaniel. 4. MARIE ANTOINETTE HAD ONE. The ill-fated Queen of France had many dogs during her short reign, but her favorite was a papillon named Coco. There are rumors that Marie Antoinette actually walked to the guillotine at Place de la Concorde desperately clutching her beloved pet. Other accounts maintain that she gave the dog to the governess of her children, Madame de Tourzel. Regardless, Coco survived the French Revolution and even lived through the Napoleonic era. At the ripe age of 22, the old dog died and was buried in the gardens of the Hôtel de Seignelay—just a short walk from where Coco’s owner was beheaded. A small square headstone still marks where the dog was laid to rest. 5. THERE ARE TWO DIFFERENT EAR SHAPES. While most papillons sport the signature butterfly ears, others have floppier, dropped ears known as "moth" ears. Originally all dwarf spaniels had these lilted ears, but slowly the fad turned to more erect ears, and the dogs started to be bred for that trait. These droopier-eared dogs are known as phalenes. Despite the different name, they are still papillons and can even make an appearance in the same litter. The American Kennel Club registers both types as the same breed while other clubs (following Fédération Cynologique Internationale standards) rule them as separate breeds entirely. 6. DON’T THINK OF THEM AS LAPDOGS. Papillons are registered as a toy breed, but don’t expect them to lounge on your lap. These high-energy dogs need a lot of activity to keep them stimulated. Papillons are highly intelligent and get bored if you don’t play with them regularly. To keep them from ruining your house or barking up a storm, try introducing interactive games or agility training. That way they can release pent up energy and won’t make you crazy. 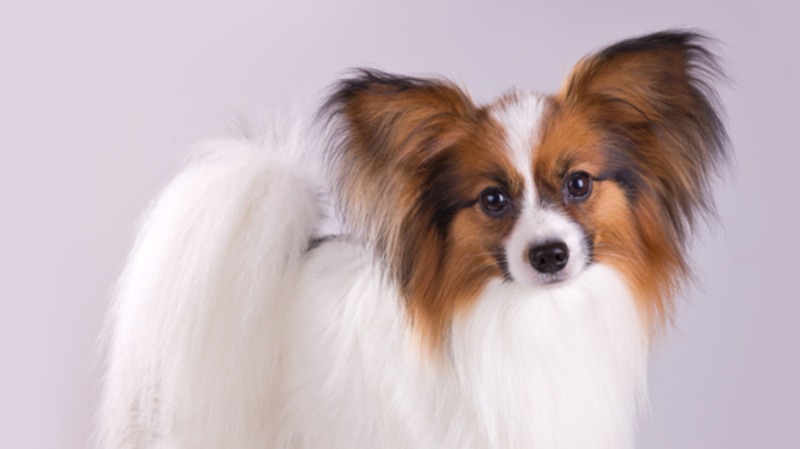 If you keep them engaged and let them get plenty of exercise, papillons are otherwise low-maintenance dogs. They do fine in both hot and cold weather, and thrive in both homes and apartments. Even during puppy-birth, the dogs generally having no problem whelping healthy litters. 7. ITALY MADE THEN POPULAR. It was France that developed and bred the little dogs, but you can thank Spain and Italy for making them popular. The Bologna region of Italy was especially helpful in the rise of the papillon. Italian breeders would transport the dogs to the court of Louis XIV on the backs of mules. Because they became so popular with French royalty, the dogs could be sold for substantial amounts of money. Thanks to their natural good looks, papillons were featured in a large number of paintings. Masters like Titian, Goya, Rubens, and Rembrandt have all included the attractive pups in their paintings. The Papillon Club of America diligently collects paintings that feature their favorite dog and catalogs them here. 9. ONE IS (RELATIVELY) RICH. When the actress Lauren Bacall passed away in 2014, she left behind $26.6 million, which was split among her three children—as well as her beloved papillon. The dog, named Sophie, was given a whopping $10,000 in order to maintain the lavish lifestyle she had grown accustomed to. The money is being looked after by Bacall's youngest son, Sam Robards, who is in charge of pampering the dog in Bacall’s absence. 10. WATCH OUT FOR SMALL DOG SYNDROME. Like most other little dogs, the papillon's size doesn’t hold it back. Often tiny dogs will overcompensate for their small stature and seek attention using other means. Unfortunately, this leads to bad behavior like biting, barking, and bullying dogs twice their size. To combat this aggressive behavior, socialization and early training is key. Just remember that you’re in charge.